Gallia Academy freshman Ryelee Sipple (10) attempts a spike in front of junior teammate Taylor Burnette (21), during the Blue Angels’ 3-1 district semifinal loss to Logan Elm on Wednesday in Londonderry, Ohio. Gallia Academy junior Ashton Webb (11) blocks a Logan Elm spike attempt during the Blue Angels’ 3-1 loss in the Division II district semifinal on Wednesday in Londonderry, Ohio. LONDONDERRY, Ohio — Kryptonite of a different color. 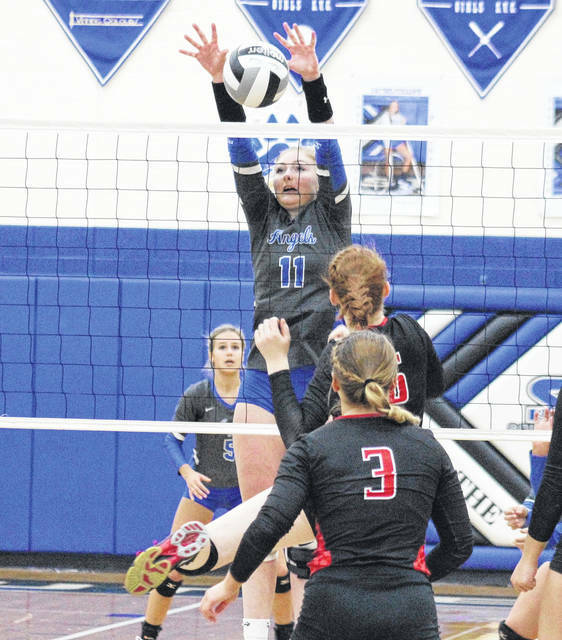 The second-seeded Gallia Academy volleyball team had its 2017 campaign come to an end in the Division II district semifinal on Wednesday night at Southeastern High School in Ross County, as top-seeded Logan Elm — clad in Red and Black — rallied back from a 1-0 deficit to take a 3-1 win. LEHS — which also eliminated GAHS from the 2016 postseason and handed the Blue and White their only regular season setback this fall— is the only team in the past two years to claim victory over the Blue Angels, who are a combined 48-0 against their other opponents during that span. 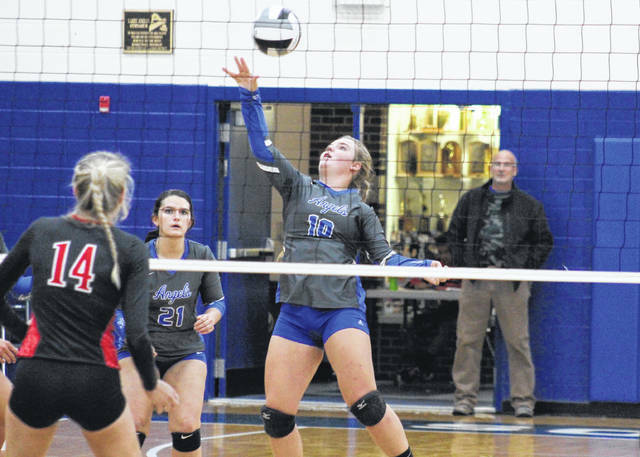 Gallia Academy (23-2) — which had won eight straight matches headed into district play — led by as many as three points in the early going of the first game. The Lady Braves (23-2) took their own three-point lead at 9-6, but the Blue Angels were back in front at 12-11. Logan Elm regained the edge at 16-15, but surrendered the next two points to GAHS and didn’t lead again in the game. The Blue Angels eventually won the opener by a 25-22 count, becoming the first team this postseason to win a game over LEHS. 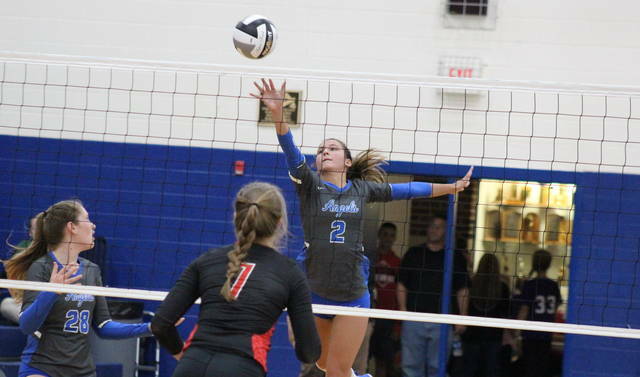 Gallia Academy held leads of 1-0 and 3-1 in Game 2, but Logan Elm took the advantage at 4-3 and never trailed again on its way to a 25-10 win, evening the match at a game apiece. The Lady Braves carried the momentum into the third game, winning seven of the first eight points. Gallia Academy began chipping away at the deficit and finally led for the first time in the game at 19-18. Logan Elm tied the game at 19 and 20 before regaining the lead at 21-20. GAHS tied the game at 21, but the Red and Black earned three of the next four points and had a game-point situation. The Blue Angels battled back to tie the game at 24 and again at 25, but the Lady Braves won the next two points and earned the 27-25 win in Game 3. Gallia Academy jumped out to a 5-2 lead in the fourth game, but Logan Elm scored five straight points and lead 7-5. GAHS tied the game at seven, but never regained the advantage, ultimately falling by a 25-14 margin. For the match, Gallia Academy finished with a side-out percentage of 46.9, while LEHS boasted a 63.0 side-out percentage. Both teams committed seven serving errors, but Logan Elm had just 11 hitting errors, while the Blue Angels committed 23 hitting errors. 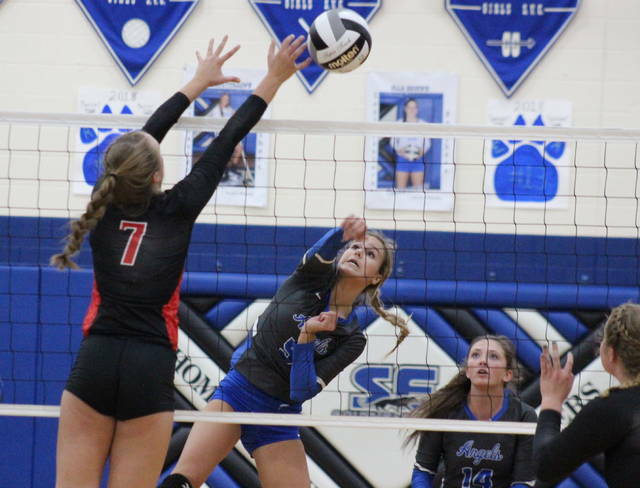 Collectively, the GAHS defense had 55 digs, a dozen fewer than the Lady Braves came up with. GAHS sophomore Alex Barnes led the Blue Angels with seven service points and three aces, all of which came in the opening game. Ashton Webb and Peri Martin finished with five points apiece, including an ace by Webb. Taylor Burnette and Hunter Copley both recorded four points in the setback, with two aces by Burnette and one by Copley. Ryelee Sipple rounded out the Gallia Academy service attack with two points. Webb led the Blue and White at the net with 26 kills and one block. Barnes contributed 11 kills and one block to the GAHS cause, Aubrey Unroe chipped in with six kills, Burnette added one kill, while Peri Martin finished with one block and a match-best 40 assists. Gallia Academy’s defensive effort was led by Webb with 14 digs, Barnes with 13 and Copley with 11. Maggie Rhoades led LEHS with 13 service points and three aces. Molly Caudill was next with 10 points and one ace, followed by Jill Congrove with nine points, and Braya Elsea with eight points and two aces. At the net, Macie Rhoads led Logan Elm with 14 kills. Maggie Rhoads posted 12 kills and two solo blocks in the win, while Maria Boldoser added 10 kills and a match-best three blocks. Grace Ewing had a team-high 17 assists for the Lady Braves, while Elsea led the winning defense with 17 digs. Logan Elm advances to the district final on Saturday at Southeastern, where the Lady Braves will battle fellow top-seed Unioto. Meanwhile, the Blue Angels will have a chance to reflect on their third straight district appearence and their sixth league title in the last five years. Grace Martin — a two-time first team all-district performer — was the only senior on the GAHS roster and, even though she missed a large portion of the season due to injury, her leadership was felt throughout the campaign. In having just one senior, GAHS will have a chance to return six juniors, five sophomores and three freshmen from its tournament roster. The Blue Angels will be in pursuit of a fourth straight 20-win season and a fourth straight Ohio Valley Conference title next fall. https://www.mydailytribune.com/wp-content/uploads/sites/42/2017/10/web1_10.27-GA-Sipple.jpgGallia Academy freshman Ryelee Sipple (10) attempts a spike in front of junior teammate Taylor Burnette (21), during the Blue Angels’ 3-1 district semifinal loss to Logan Elm on Wednesday in Londonderry, Ohio. https://www.mydailytribune.com/wp-content/uploads/sites/42/2017/10/web1_10.27-GA-Webb.jpgGallia Academy junior Ashton Webb (11) blocks a Logan Elm spike attempt during the Blue Angels’ 3-1 loss in the Division II district semifinal on Wednesday in Londonderry, Ohio.